My husband and I don’t get to go away too often over night. While staying at a quaint B&B always sounds romantic and fun, it just isn’t in our budget outside of a special anniversary. And with kids, getting away is definitely more of a challenge. One thing that has always been important to us is that we create a haven from the world right in our own home. We decided early on in our marriage that most of the time, we’d rather spend $200 on something lovely for our home than spend $200 for one night away. Not to say we don’t like to get away, but we like to balance time away with creating a wonderful life right under our own roof! Since we value our marriage and want to make sure that we “get away” from it all at times, we pay special attention to filling our home and especially our bedroom with special things that give us the Bed & Breakfast feel every day. Bed & Breakfast in your own bedroom? 1. Grab & Box Technique. Let’s start at the beginning. If your room is overrun by toys, electronics and piles of laundry, it most certainly won’t feel like a bed & breakfast! That is pretty obvious, no clutter allowed! But if you have trouble keeping your room clutter free, here is my realistic suggestion (which you may have heard me talk about before!) for a quick solution: at the end of the day, right before dinner if you can manage it, do the grab & box technique. Take a big box or laundry basket and gather up all the stray stuff that has made its way to your room and set it “somewhere else.” While you will still have the basket to deal with later, at least your room will feel clean and ready to unwind in at the end of a long day! I would prefer to have my room perfect and clutter free at all times, but at the very least it should be tidy when we want to retreat there in the evening! Next, focus on cleaning. Who would go to a Bed & Breakfast if they choked on dust every time they entered the room? Even if you have animals, like we do, you can at least try to keep the dog hair off your bedding. We would never let Winston lay directly on our bed. Way too icky of a thought for me! We have a dog blanket to put out if he wants to be on the bed (my husband lets him up there, I would never do that!). When we want a clean bed, we whisk off his blanket! Keeping a room free of dust isn’t easy, but running a quick rag over your nightstands and lamps and vacuuming the room will go a long way to making things feel more like a B&B. One thing I feel is a must for obtaining the B&B feel is quality bedding. I do not like scratchy sheets. Fluffy pillows and good quality sheets on my bed are important to that B&B ambience. I have mentioned this before but I only have one set of sheets! I know that must sound terrible to those of you who love having options, but I just have one quality set. Not expensive, but just good quality! Better one quality set than a bunch of cheap sheets! When I picture a quaint B&B, I picture layers of warmth. Curtains with bamboo shades or shutters underneath. Big pillow shams and decorator pillows on the bed. Pretty bedskirts and a cozy throw over a chair. A fireplace, candles or glowing lampshades. The feeling of a warm nest is essential to that B&B feeling, especially in the fall! I love the chill in the air when I have a cozy bedroom to curl up in! A B&B ambience requires peace & quiet. Lots of fabric and rugs will make you feel like you can settle in for a peaceful night. Without enough softness, a bedroom feels loud and uncomfortable. A TV can be questionable to me, seeing and hearing a TV ruins the whole ambience of my B&B ideal. I’d like to see piles of books on the nightstands instead! If a TV is a part of the mix, I would at least like it to be hidden or inconspicuous. A TV can be fine in a bedroom as long as its purpose is to enjoy an occasional movie and not the evening news or sporting event. But that is just me. Think about the scent of the room, the feel of the fabrics, the surrounding sounds and the beautiful colors of the room. Your impression of the room when you walk in is greatly affected by the senses, so pay special attention to making the room appealing on all levels. I love a really good smelling linen spray to freshen up sheets and give the whole room a delicious scent. Think about the colors you use and what mood you are trying to create. Try to add as many textures to the room as you can. Add glass for visual sparkle and blankets for pulling up around you. I like the idea of staying in a B&B every night. More often than not though during the fall and winter, I am falling asleep in my flannel pjs and warm socks. Not exactly a romantic look. But if you really want to play up the feeling of a special night away, pack a bag of special overnight clothes! Most of us think more about what we wear out to dinner than we do about what we wear to bed. Surprise your husband some night by opening a suitcase packed with something other than your cartoon faced tee shirt! That would really add to the B&B ambience now, wouldn’t it? 8. Breakfast in bed ambience. For the longest time I have wanted a breakfast in bed tray. The last one I had I ended up giving to a friend. Keep your eyes peeled for one at a garage sale or discount store. If you are planning a special “B&B night” with your hubby, you could set out some muffins and big coffee mugs on a tray, and set your coffee pot to turn on in the morning so you’ll wake up to the scent of coffee wafting through the air! Just like a B&B! 9. Make it a true getaway! In order to capture the true essence of a B&B, I am probably one of those rare people who would rather not have many family photos in my room. Not because I don’t love my kids or parents or nieces and nephews or great grandparents, but because I try to conjure up the feeling of a true getaway in my bedroom. Where would I go that I would see 30 pairs of eyes staring at me in the darkness when I was relaxing in bed? I like my family photos in the hallway where I can smile back at them every time I walk by. Again, that might just be me. I try to select artwork and accessories that remind me of true getaways in my life. I like to have pencil art from places my husband and I have been! I know I am getting all controversial by saying I don’t want too many family photos in my bedroom and now I am going to tell you I like to have a lock on my door to keep my kids out. 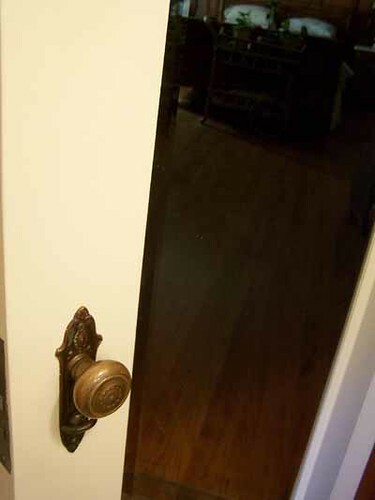 Here is my thought…you cannot have a true getaway if you are going to allow your door to be open all evening long. Even if you are just enjoying a good book you deserve a place in your home where you can enjoy a few moments of peace away from the hustle and bustle of your home. If you do not have a lock, I would encourage you to teach your kids about knocking on doors and waiting until you have been invited in before entering. And even better, if you have kids old enough to read, make a sign for your door that reminds them that you are having a few moments to yourself. I know that isn’t really an option when kids are tiny, but once they enter grade school you can definitely expect them to respect your privacy for a short while each day. It is important for your sanity, so don’t feel guilty about having your own B&B escape right in your own home! What would your dream B&B look like? The Inn at Perry Cabin, [from their website] “a luxurious manor house resort and spa, is located in the Victorian resort town of St. Michaels on the Eastern shore of Maryland. Steeped in history, this colonial mansion exudes calm and elegance, the perfect hideaway.” Don’t you wish your home could be described like that!? I’d definitely stay at this resort if I could! It looks positively dreamy! Fall is about cozy details. This week would be a great time to gather up your soft blankets, wool scarves and felt to re-purpose them around the house! I’m not that skilled with a lot of the domestic arts, but I love ideas that make me feel like I had some “hands on” experience in creating special things for my home. So, grab your glue gun or glue sticks and get ready for 8 EASY “homespun” ideas! Fall is in the details. How about creating your own monogram with felt & glue? Trace and cut a monogram out of felt. Adhere it on a pretty piece of fabric and tack around an ordinary pillow. Instant personality! Add a strip of wool and some fringe to ready made curtains or sheets with a trusty glue gun and even I can be a seamstress! I loved those cute little “balls of yarn” in a bowl. These are simply strips of wool wrapped around craft Styrofoam. Such a cute fall accessory for a coffee table or entry table! Bundle up your summer pillows, shams and bedding with layers of coziness! Wrap existing shams with scarves, old blankets, flannel sheets, or a sweater. Tie and or tack in place for instant fall warmth. Make a seasonal dust ruffle with a blanket or flannel sheets. Tie loose edges with ribbon for a special detail. Create sweet little silhouettes of your favorite pooch to fill up an empty wall! Spray paint mismatched frames in autumn colors. Trace whatever shape you want onto black felt. Cover the frame’s cardboard insert with a flannel sheet (how cute to use hounds tooth with a hound silhouette!). Glue the felt shape on to the sheet and reassemble frame. Warm up a cold doorway with a no sew blanket curtain! Fold over a rod or hang from hooks. For a custom look, fold over top to create a “valance.” Looks great and can save energy if you use a warm blanket around a drafty door or window. This is something I do every year because we have old windows! 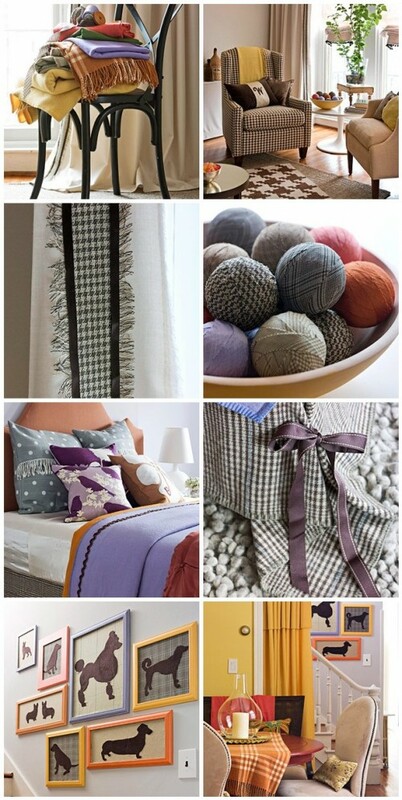 Use plaid or autumn colored wool scarves to dress up a table or chair! Find monogram templates here (you will probably have to shrink them down to size if you want to use them on a pillow) as well as other templates for decorating pumpkins! Photos and ideas found at Better Homes & Gardens! This post adapted from a post published in Fall 2008. I think I sadly neglected to mention the winner of the awesome gilding kit from Caromal Colours…my apologies. The winner is Nicole at Our Cozy Nest! If you didn’t win the kit (ha, most of us didn’t), I strongly encourage you to check out the Caromal Colours website and perhaps make gilding one of your fall projects! Don’t forget to mention PattyH as your code when you order!